Named for the South American military man and lothario, Simon Bolivar, this mighty Cuban brand is rightfully a colossus among those who tend to reach for a strong, full-bodied cigar. Packed with ligero since its inception in 1902, Bolivar may not today be as strong as it once was – there is a common consensus among aficionados that Habanos SA (the Government-owned manufacturer and distributor of Cuban cigars) has brought the line ‘back towards the pack’ in recent years in terms of power. But that’s not to say you should Simon lightly though; light up a Bolivar Coronas Gigantes without giving it the respect it deserves and you may find yourself wishing you’d opted for a round or two with Anthony Joshua instead. 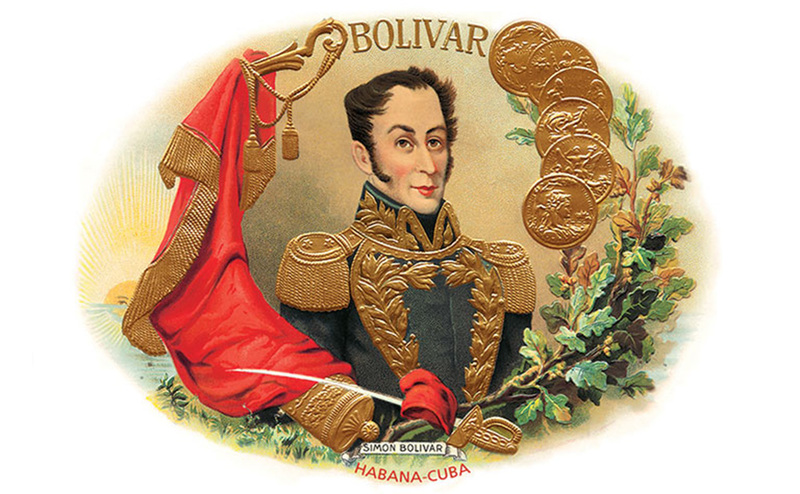 The classic Bolivar is perhaps the beloved Belicosos Finos. This beautiful, pyramid-shaped cigar (this particular shape known as a campanas in factory terms) is perhaps not as full-bodied as it once was, when its bold, peppery, earthy character was one you had to work at to appreciate – like a well- poured pint of Guinness. But today’s Belicosos is still a sensational smoke, even if it’s a nine instead of 10 on the Richter scale. Other vitolas in the marque worth looking out for include the Royal Coronas, a tasty little Robusto which, for reasons only known to Habanos SA themselves, often runs in a little cheaper than most other cigars of similar size. The RC is like a slightly more companionable cousin to the Belicosos; good fun to take on a night out and show you a good time, without being the sort of rabble rouser who’ll have you waking up in a police cell come cockrow. The last couple of remaining current production Bolivar Tubos are worth a gander, too. These are the cigars sold in aluminium tubes and which, if they’re decent, are a Godsend to slip into one’s jacket pocket as one heads out of the door in case there’s a chance to grab a smoke sometime during your evening. These Bolivar No’s 2 and 3 in these tubes are worth a punt on when you find them. Neither of them are earth shatterers, but they will give you a good smoke for your money and can be relied on to serve with distinction. There are slew of sadly discontinued Bolis. If you ever get the chance, snag an Inmensas, which was discontinued in 2009 after 50-odd years of faithful service. There’s nothing quite like this attractive looking Lonsdale on the market any more and aged boxes are like hen’s teeth. If you’re looking for aged stock – from any Marque – it’s worth speaking to one of the Sautter experts. We have a few treasures of our own locked in the keeps and we also have a firm ear to the ground on what’s currently available on the private market. We’ll do our best, as always, to help.